The purpose of this guidance is to help ensure statewide consistency in the transportation improvement programming process. This article is intended to be a tool to assist MoDOT employees in fulfilling the requirements for programming transportation projects. MoDOT employees involved in a specific MPO’s transportation improvement program (TIP) process should familiarize themselves with that MPO’s specific policies and procedures. TIP programming guidelines have been developed to assist MoDOT employees in their programming efforts related to the annual or biennial TIP update. The guidance contained herein is intended to assist employees with adding and modifying projects in an MPO program between updates. A TIP may be revised at any time under procedures agreed to by MoDOT, MPO(s) and public transportation operator(s) consistent with the TIP development procedures in the regulations, as well as the procedures for the MPO public involvement plan (PIP). Each MPO’s PIP sets the timeframe for public review through the draft and final stages. Each MPO must give the public a reasonable opportunity to comment on the draft and have those comments considered for inclusion in the final. A summary of comments and responses to them should be included in the final TIP. As with a TIP update, each MPO policy board and the governor must approve a TIP amendment prior to requesting approval from OneDOT (together, the Federal Transit Administration (FTA) and the Federal Highway Administration (FHWA) are known as OneDOT) to incorporate the changes into the statewide transportation improvement program (STIP). MPOs in non-attainment and maintenance areas must provide sufficient documentation and analysis to demonstrate that the TIP conforms to the state implementation plan (SIP). This is done in accordance with the requirements of the Clean Air Act (CAA) and federal transportation conformity guidance. If either Federal Highway Administration (FHWA) or Federal Transit Administration (FTA) finds it is not in conformance, the MPO must make changes to the amendment until conformity can be demonstrated. Transportation legislation specifically defines two types of revisions to TIPs, administrative modifications and amendments. A minor change in project/project phase costs. A change in funding sources of previously included projects; unless the change is adding federal funds to the project. An administrative modification does not require public review and comment and may be processed through the MPO administrative processes with communication of the changes to the MPO policy board, MoDOT and OneDOT. Addition or deletion of a project. Major change in project cost. Major change in the initiation date for a project or project phase. Major change in project design concept, design scope or limits. An amendment requires public review and comment, re-demonstration of fiscal constraint and, if the project is regionally significant, a conformity determination in air quality non-attainment and maintenance areas. Each MPO's Public Involvement Plan will dictate how that MPO handles amendments. 1. Adding any project to the first four years of the TIP. Unless a federal action in the current year (or second year for two year TIP cycles) requires an amendment, projects should be added at the TIP update. 2. Deletion of a project that uses federal funding or is regionally significant from the TIP. This should also be done at the TIP update unless it involves the addition of a new project along with the deletion. Changing the character of work or project limits of a project within the first four years of the TIP such that the original project description is no longer reasonably accurate. A change that impacts the funding of a project within the first year of the TIP. This will be done if the project exceeds the lesser of two thresholds relating to percent of total federal funding programmed for the current calendar year or a specific dollar amount. Thresholds reflect the varying size of projects and programs among different sized MPOs. MPOs identify threshold levels appropriate to their size of program and amount of funding. Agreed upon thresholds and TIP amendment criteria should be included in the MPO PIP. In order for MPO staff to have sufficient time to review and place a proposed amendment on the MPO agenda, the amendment must be received by a pre-established time based on the given MPO’s deadline policy. A project's sponsoring agency is responsible for assuring the project is included in the current TIP/STIP. MoDOT Central Office Transportation Planning, district offices and MPOs are responsible for working with local agencies to ensure projects within the MPA are included in TIPs. As with updated TIPs, revised TIPs must be provided to OneDOT and posted for public review on the MPO website. Once OneDOT deems a TIP fiscally constrained and a revenue source is subsequently removed or substantially reduced (i.e., by legislative or administrative actions), OneDOT will not withdraw the original determination of fiscal constraint. In other words, it does not affect the TIP. If this happens, however, OneDOT will not take action on an updated or amended TIP that does not reflect the changed revenue situation. So if the TIP is amended, the change in revenue will need to be addressed at that time. The first issue to resolve is whether or not the project is regionally significant. Any addition of a federally funded project requires an amendment. The main reason is so that fiscal constraint of the entire TIP can be re-demonstrated. Some MPOs may consider the addition of any project, regardless of funding source, to be an amendment within the context of their processes. 1. Advance Construction has been applied on the project. 2. The project is regionally significant. Change from any source to a federal source requires an amendment. Any other funding source change can be done administratively. Any description change that does not include a scope or cost change can be done administratively. Generally, a change in the scope of a project should be considered for an amendment action. This is the type of change that has the most potential for varying interpretations. If the change in scope does not affect the limits of the project or the cost significantly (see "Project cost change? ", below), then the change can usually be made administratively. 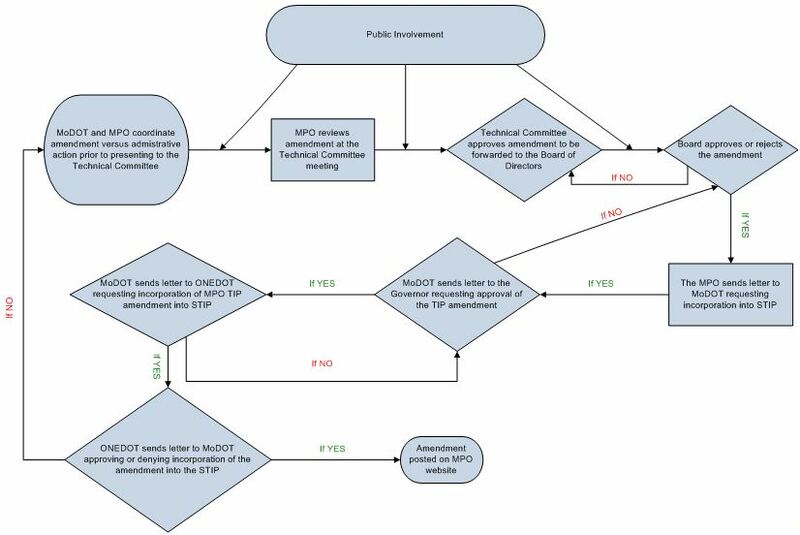 If the change in project cost exceeds a given threshold, which is determined by each MPO and published in its Public Involvement Plan or other pertinent document, then the change will require an amendment action. These thresholds usually run between 15% and 25% of total project cost. Dividing a project into two or more projects? A “split”, as this is often called, is a fiscally constrained and scope constrained separation of a parent project into two separate projects. This may be done for various reasons including issues requiring the letting of different portions of a project at different times or to, in some way, facilitate the implementation of the parent project. Generally, splits can be made administratively unless the change in the parent project cost exceeds a given threshold, which is determined by each MPO and published in its public involvement pan or other pertinent document. In this case, an amendment action is needed. Thresholds usually run between 15% and 25% of total project cost. 1. So that fiscal constraint of the entire TIP can be re-demonstrated. 2. In non attainment and maintenance areas a regionally significant project has to be included in a transportation demand model run and a new conformity determination has to be made before the project can be included in a TIP. Existing regionally significant project changes do not differ from non-regionally significant project changes. If the project is included in a TIP, the conformity requirements have already been met. This page was last modified on 12 May 2011, at 15:40.